Photo: The BS 5609-approved Inkjet Special PP self-adhesive labelstocks from VPF show highest resistance to sea water and abrasion. 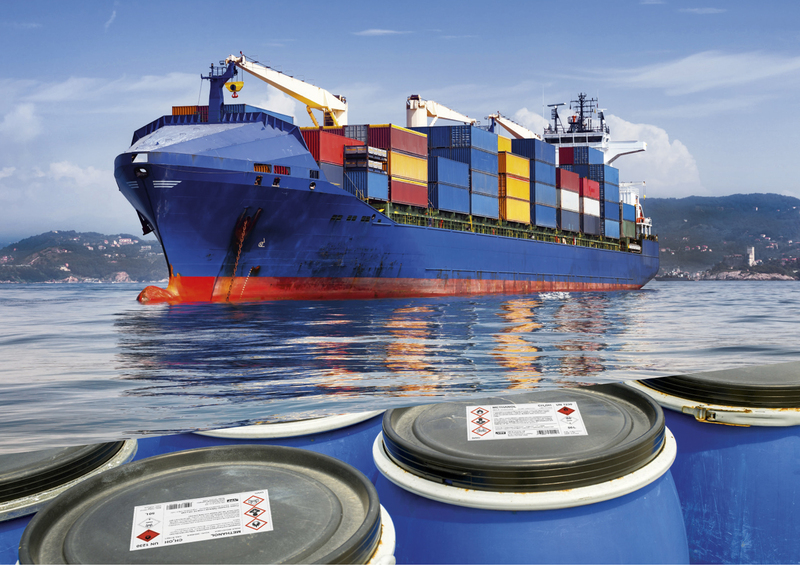 They thus fulfil important requirements for dangerous goods labelling in international goods transports. An ocean of difference – VPF GmbH & Co.KG has succeeded in bringing to market an inkjet PP film that is not only printable with water-based inks but also meets the seawater-resistance requirements of the internationally recognised BS 5609 standard and is suitable for all common pigment printing systems as well. Together with its seawater-resistant adhesives in dispersion, hot melt and UV-acrylate technologies, the Germany-based manufacturer of specialty self-adhesive labelstocks now offers a complete range of innovative materials for dangerous goods labels with exceptional resistance to water and abrasion, as demanded for international transports of chemicals. This opens up completely new possibilities for in-house printing of coloured label elements, particularly for small and medium batches with frequently changing language combinations. The new inkjet solutions from VPF are highly efficient and flexible, providing an outstanding alternative to post-printing using thermal transfer systems or laser printers. The entry into force in the summer of 2015 of the GHS system (Globally Harmonised System of Classification and Labelling of Chemicals) brought major changes in the framework conditions for dangerous goods labelling. New lozenge-shaped hazard pictograms with red borders have replaced the old hazard symbols on orange backgrounds. 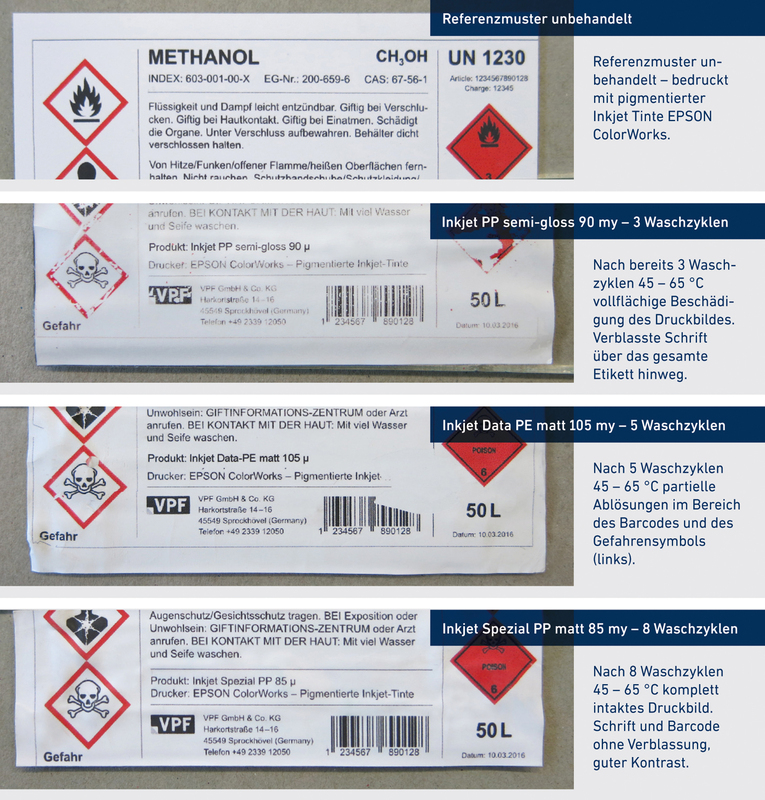 Conventional multistep label production processes using pre-printed coloured labels for customisation – either by thermal transfer or laser printing – are now seldom possible because the number of GHS pictograms on the label must be identical to the number of hazards declared for the product. The label must not contain any pictograms that are not applicable and there must be no empty, unprinted fields on the label. For these reasons, in-house colour printing of GHS labels using water-based inkjet printing methods has become the ideal solution, especially for small and medium-sized print runs. However, until now it was very difficult to meet the international trade requirements regarding sea-water resistance of hazard labels with commonly available inkjet materials. These requirements mostly specify compliance with the British standard BS 5609. Previously existing inkjet-capable PP films were not able to fulfil the requirements particularly with respect to resistance to leaching through long-term immersion in sea water and abrasion of the inkjet coating after rolling in a mixture of sand and sea water. These difficulties have now been overcome with the new VPF self-adhesive labelstock. The innovative film called Inkjet Special PP white matt (85 µm) being introduced to the market allows printing that is resistant to UV light and sea-water as well as being especially resistant to abrasion. This effectively eliminates expensive pre-printing and cumbersome customisation of GHS labels using the thermal transfer method or tricky laser printing operations involving high heat input. For certification of the new film, the inkjet self-adhesive labelstocks were printed using pigment inks on commonly employed printing systems from Kiaro, Primera and Epson. Passing all tests, the material was approved as compliant with BS 5609, Section 3 for all three printing systems. For use specifically in hazard labelling applications, VPF relies on its adhesives for drum labelling that have been proven in use over many years and are themselves certified according to BS 5609, Section 2: a strong bonding permanent hot melt adhesive HM 347 and the UV acrylate HM 709 UV with exceptional media resistance. Both of these adhesives are applied in increased coat weights to ensure outstanding adhesion even on difficult-to-label surfaces, such as rough HDPE fibre drums for chemicals, and are offered with coat weights of up to 40 g/m2 for this purpose. For simpler applications with standard coat weights up to 22 g/m2 the water-based dispersion acrylate 922 VP is also available. The new Inkjet Special PP self-adhesive labelstocks can also be used to optimize many applications where seawater-resistance or certification to BS 5609 are not the main objectives. These include all kinds of labelling applications requiring high resistance to abrasion, as well as labelling of articles which naturally need to be highly resistant to water, cleaning agents and to sunlight (if stored outside), such as gardening, swimming pool or laboratory equipment. With its extremely resistant Inkjet Special PP self-adhesive materials, VPF is broadening its product portfolio for commercial and industrial labelling solutions and further expanding its innovation lead in aqueous inkjet labelstocks. Photo: Resistance tests of the newly developed Inkjet Special PP white matt 85 µm film after several washing cycles at 45 to 65 °C compared to conventional Inkjet PP and PE reference materials.